Olde Green Cupboard Designs: Bonnie Blue has entered the building!! Hi everyone!!! Thanks for following our blog. It's a new, quick and easy way for me to reach all of you and keep you up to date on the Olde Green Cupboard's life! Paula Barnes from Bonnie Blue Quilts is with us...right now... right here... at the Olde Green Cupboard! Today she, Vicky and I are sewing together ... working on store projects of course. We were going to take her antiquing but she has asked to have a sewing day... poor thing...she never gets to sew. She's always at her computer designing... so you know us... we gladly said YES.. since it's hard for us to get sewing done too. Saturday she will be teaching one of her new designs - Cabin Creek. Now... let me tell you...this quilt is HUGE. The last show we attended they were our neighbors...right behind me at the cash register. That quilt is so big it was hanging 10' back and over 8' tall... I had to pin the bottom of the quilt up so I wouldn't walk on it and get it dirty. What an awesome piece of work Paula (she's on the left)!!! Good job... and good job to Mary Ellen (she's on the right) that pieced it! 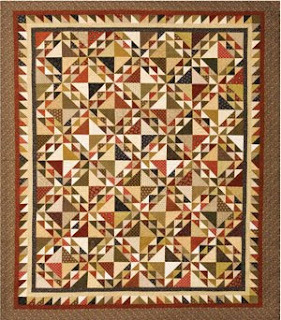 Then Saturday evening she will show us over 30 quilts that she has designed along with a little story about each. We'll have a big crowd for her...!! Ok... I'm off to get my sewing machine packed along with 50 million other items that you just need to take...'cause if you don't... then you'll need them!!! Know what I mean?